As you may know both PowerShell Studio and PrimalScript support multiple versions of Windows PowerShell and allow you to switch between versions depending on what versions of PowerShell are installed. Note: V5 will be officially supported after its release. We do not offer support for preview versions. Windows PowerShell V2 is the only version that can be installed side by side with the newer versions of Windows PowerShell. 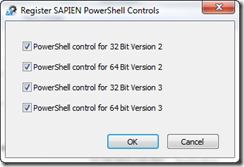 After Windows PowerShell V3 each new version replaces the previous iterations. When working with our Script Packager, you will notice that there is no option listed for V4 that is because the V3 Platform engines also works with V4. Therefore if you are ever in doubt, choose the V3 option. When installing a new version of Windows PowerShell (see the related article below) you have to run the RegisterControls.exe. 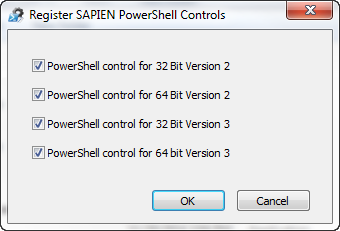 The version 3 options also applies to Windows PowerShell V4.